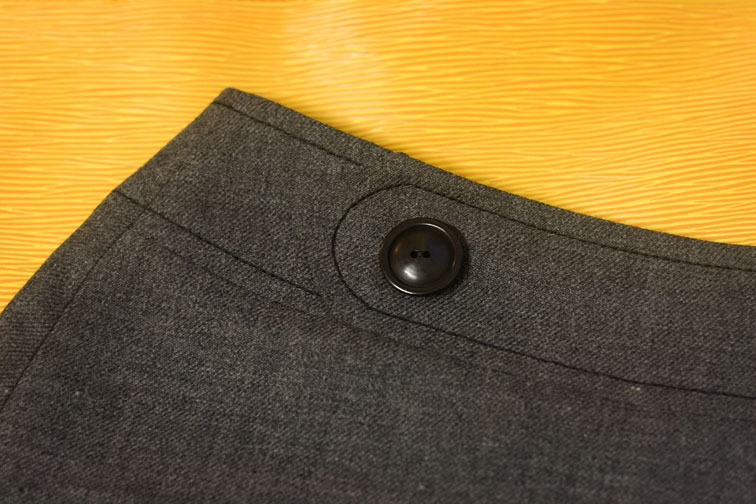 I’ve been wanting a scalloped hem skirt for ages but never had the ‘right’ fabric – until I rummaged through the stash the other day and found a metre or so of some grey marl mystery fabric that I thought would be ideal. It is quite scratchy though, I fear it is some sort of polyester-made-to-look-like-but-definitely-not-feel-like-wool. But beggars can’t be choosers – it was a free acquisition, plus has the double bonus of reducing the stash. I thought if I lined it in silk satin that might counteract the negative, and I’ll just avoid touching the outsides! It is a basic A-line with curved waistband that has a curvy inset piece highlighted with topstitching with scallops stuck on the bottom. Initially I imagined a giant buttoned patch pocket three scallops wide, but it was so big it didn’t really look right anywhere, so I abandoned that idea. Consequently the skirt is plainer than originally intended, even with the stitching detail. At 55cm it’s a bit shorter than my usual length too, but this is a winter skirt and I kid myself I can get away with it wearing tights! 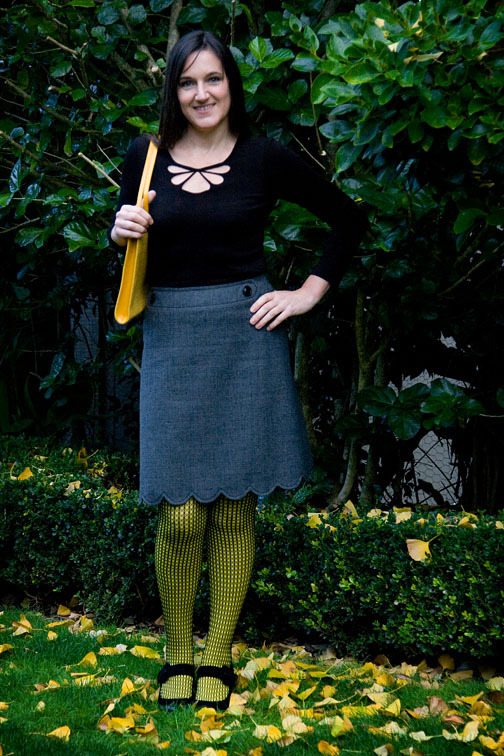 I’ve been onto DH all week not to mow the lawn, so I could photograph this skirt with all the fallen ginko leaves, which match my tights and new $1 bag perfectly! The top is a Nouveau Top from my Winter 2002-ish collection – it still fits! A scalloped hem with topstitching – coming up next I have a post on how to sew perfect scallops, quick and easy! Do you wear a lot of grey? If so, what are your favourite colours to wear with it? WOW! I absolutely loooooovvveeee this skirt! The topstitching is just fantastic! Love your new blog banner as well! Sherry, Lovely new look … I love your new skirt and I am eagerly awaiting your tutorial about the scalloped edges. The workmanship is beautiful and I think the length is perfect. The scallops are so perfectly executed! It's a really cute, on trend skirt. I like grey with yellow and orange too. You are right, grey is very versatile. Another great project – and I LOVE your tights! I love grey too. I think grey is a lot more versatile and looks a lot better with colours than black does, less harsh somehow. Gorgeous. I love grey, with almost every colour. It's so versatile and beautiful. The skirt is fantastic and your stitching looks impeccable! Nice job on the scallops. But I have to laugh, 20 degrees in your winter and we are having trouble hitting 20 in our summer here. Yet I am wearing sandals and capris, while you are wearing sweaters and stockings! Guess it's all relative. I absolutely love it. It's perfect. I usually wear black with grey but it's such a neutral color that you can match it with anything. Can't wait for the tute! So adorable. The scallops look wonderful. As for wearing gray…yes! I love gray and yellow together. If I could re-do my wedding I would go with gray, yellow and aqua hues. I LOVE the scalloped hem! It is not too short with or without tights. The skirt is amazing, just love the scalloped edge too. Would love to try this. And I adore your tights too. Beautiful scallops – I don't think it looks too plain. I esp. love it with the tights. It's beautiful. Love how the scalloped hem mirrors the cut-out in your top – styling perfection!! Also, very jealous of the Auckland winter…the English summer is struggling to reach 20 degrees! Grey, Brown and Navy are almost as important in my clothing as Black. In fact, since I started working after college, I've alway owned (and made!) at least one pair of trousers or skirt in Grey. I love your skirt, so cute! I think I need scallops in my life, LOL! Firstly I should mention that my DH doesn't need asking NOT to mow the lawn – he's really good at not mowing the lawn ;). I always look forward to seeing what you have made and this beautiful skirt is no exception. You have made a relatively simple skirt look very special – the scalloped hem, the topstitching and the buttons are all so lovely!! 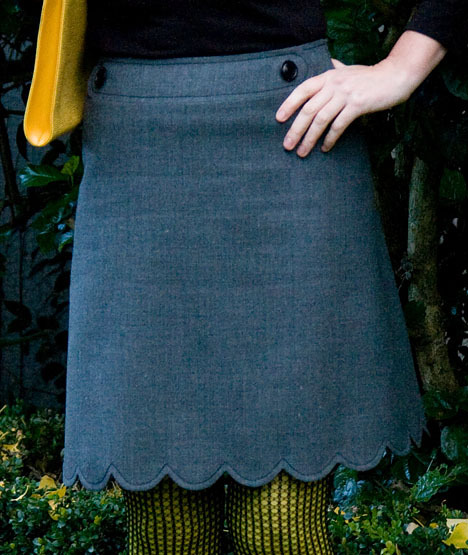 I don't think you need more detail on this skirt because of the scalloped trim. It might look too cluttered. I think it's perfect as is. And I love how you styled it. What a fun project. Love this skirt! I want to make one too now! Very nice and you are right about gray being very versatile. I wear any bright color or print. Orange as you thought is great, so is fuchsia, pink, royal blue and the old standby red. Your skirt is lovely. So cute! I love scallops, I make them all the time, can't wait to see how you do it. And grey is my preferred neutral – looks so good with most anything. are those tights 2 colors? interesting. I LOVE this skirt. I've been a little luke-warm on the scallops thing going around, but something about your (flawless) topstitching absolutely makes them pop. Gives them the right amount of weight or something. I love the length, too. And the topstitched tabs on the waistband. And… and… It is the perfect thing ever for pairing with some bright funky tights. Good job! 🙂 And I am excited for your scallop tutorial, too. I love the skirt, actually I love the whole outfit, you look great! How adorable. The scallops and top stitching really give interest to the fabric. Love those tights! Fabulous skirt. The scalloped edge and tabs are super touches – great points of interest. The tights are amazing and do look stunning next to the grass. wonderful skirt. I love combination of a garment in a traditional menswear type fabric with unique feminine style details. I wear a lot of gray. Lately with teals, caribean blues,greens and orchid purple. Great looking skirt. Love the scallop edge. I really love this and have been dreaming about the 2 or 3 scalloped garments I've seen. I look forward to seeing how you get perfect scallops! I´ve been following the scallop wave wondering what would be the best way to finish them… and voilá!! your topstitching is sublime! Love the scallops and looking forward to your tutorial. Your skirt is amazing. Hey, cute skirt! I was wondering about the top before you mentioned it…great design, very flattering! Love the skirt! 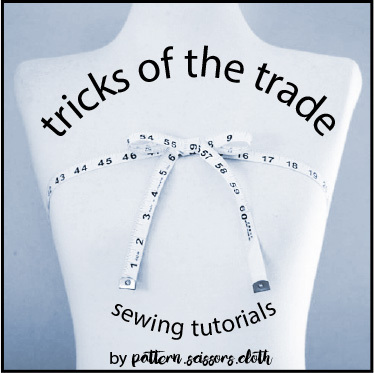 Any tips you can provide on perfecting topstitching are welcome here! I struggle trying to see exactly where my stitches are falling when I topstitch. I do use a post-it note paper on my machine to align with the border, but I'm hoping there is a better way! Thanks for your blog – it is enjoyable and informative. What a fun outfit and beautifully sewn skirt! I love that skirt! V much looking forward to your scallops tutorial! Love this skirt! Your scallops look perfect, and the top-stitching really brings them out. Can't wait for the scallop tutorial! Yep this is lovely and I really like the length on you too. Funny how we get used to wearing skirts at around a certain length. Wish we had nice leaves – we've got pine needles! I think the skirt is fabulous. I lve the stitch detail. those neon yellow tights look absolutely killer with you scallop skirt! Love it! So awesome! I lOve the scallop! Also happy to see I am not the only tight layering person. Purple or fushia with black detail over top is my fave!